1. Chanel Les 4 Ombres Eye shadow Palette in Kaska Beige — the colors are subtle and perfect to transition from day to night. 2. Chanel Inimitable Intense Mascara — my favorite go-to mascara for years. 3. Lancome Blush Substil in Tangerine Tint — perfect touch of peach. 4. Smashbox Photo Finish Luminizing (New Find!) — Absolutely love this primer that gives a lovely glow and a tint of bronze. 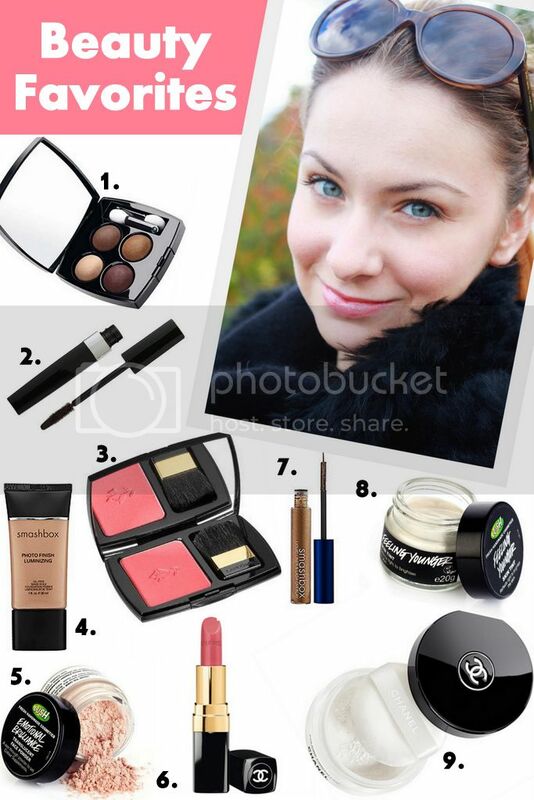 Perfect for winter when skin can look a bit dull. 5. Lush Emotional Brilliance Translucent Powder (New Find!) — Part of Lush's new make-up line this shimmering powder is perfect for highlighting. I use it as an eye-shadow base and on my cheeks. 6. Chanel Rouge Coco Lipstick — Perfect lipstick for everyday - moisturizing and it lasts. 7. Smashbox Liquid Liner & Lash Overlay — Perfect for nights out. Instead of traditional kohl color, I use this liquid liner with a touch of sparkle. You can also use it to add a little gold to your eyelashes. It's a fun product to have! 8. Lush Feeling Younger Skin Tint (New Find!) — I mix this formula into my morning face cream to brighten my skin. I also dab it under my eye to cover up dark bags. I am in love with this product! 9. Chanel Podre Universelle Libre ( New Find!) — I've finally made the switch from pressed to loose powder and love it. The look is much more natural and it is easier to apply. I am curious to know, what are your favorite beauty products?